“Resilience” is one of those words used so often it sometimes seems to lose its meaning. But when you see U Aung Min and his family living under a tin roof with only one wall beneath it, you know exactly what it means. U Aung Min is a family farmer in Central Myanmar’s Bago Region. Not long ago, he was a classic subsistence farmer—whatever came out of the ground went to feed his family. Then a CRS/Caritas food security project came along. With added support from a CRS partner, U Aung Min learned how to plant rice in rows, getting a bigger harvest using less seed. He also learned how to make his own inexpensive natural fertilizer, how to compost food and plant materials for a greater yield, and how to take care of minor injuries and illnesses in his farm animals that would otherwise not have access to veterinary care. 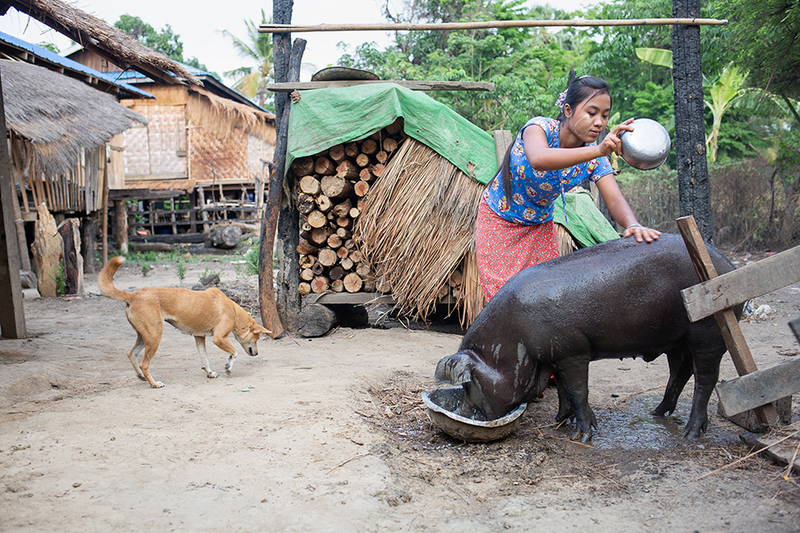 The Su Aung, U Aung Min’s oldest daughter, rinses off the family’s pig. Their pig is healthier than animals they raised in the past, thanks to education about vaccine schedules, and early diagnosis and treatment of common ailments. The result: U Aung Min didn’t just feed his family—his farm started turning a profit. And that was so important when disaster struck. Not long ago, the fire would have left his family homeless, facing an uncertain future. But the farm profits he had saved helped U Aung Min—a trained carpenter— start rebuilding immediately. He and his wife, Cho The Mar, and their children now live in the partially reconstructed home. As money comes in, most of it from their farm, they are buying more materials to continue rebuilding. U Aung Min’s family can use their improved farm income to slowly rebuild after a devastating fire. Even with a half-finished house, Cho The Mar is already making it a home. The living space is inviting, with thatch mats and plentiful pots of green tea. Out back, the family’s pig munches on kitchen scraps. Cho The Mar mentions that it’s one of the healthier animals they’ve raised as they have better knowledge of vaccines and how to treat skin conditions, thanks to the project. This is, in a word, resilience.